Welcome to the Wangolina blog. Here is where we will be highlighting news, events and all goode stuff that has been happening around our little patch on a very ad-hoc basis. The 2019 vintage is progressing well here in Mount Benson. With all of our white grapes harvested between the last week of February and the second week in march signalling a long term normal timed vintage for the region. 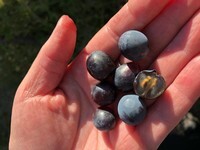 We are still in the midst of vintage in early April with growers beginning to harvest red grapes over the coming days. The season was well founded upon a wet winter with higher than average rainfall but with average temperatures. Budburst in the Mount Benson region was later than recent years with most varieties completing budburst 1-2 weeks later realigning our harvest timing to our more traditional vintage season. A heavy rainfall event in November occurred in the flowering season, impacting Pinot Gris, Cabernet Sauvignon and Sauvignon Blanc with these varieties showing some hen and chicken. Temperatures during the summer season were also in line with our long term averages however a heat spike in late January with an associated record hot day of 41.8 deg C, assisted to bring the white harvest forward slightly. While the rest of the state battled this heat and lack of water the cool and more importantly consistent climatic conditions of Mt Benson again reinforces the importance of it as a premium wine producing region in a changing climate. Good bright aromatics and vibrancy are once again abundant in whites which are showing some promise for the vintage with great natural acid retention and in some cases proving to be challenging. This (natural acid retention) has also translated to the red varieties with a lower need for adjustment giving great age ability to these wines. Flavour and phenolic ripeness in red varieties is appearing to preceed the sugar ripeness giving us a much desired lower alcohol vintage. It has been a challenge for the vignerons this year to fit back into a more traditional vintage with wineries staffing themselves based on the more compressed vintages of recent years. The hustle bustle of these more compressed vintages has been the norm and with a more spread out laconic vintage winemakers and growers have found themselves in their vineyards sampling and assessing more often. It has been a wonderfully social vintage this year for the winemakers with more time to enjoy a beer or two with the neighbours. The growing season is progressing a little behind when compared to most other recent years at Wangolina. We've had a lot of cooler weather this spring and consequently at Christmas time the vines were about three weeks behind where they would've been in the past four years. It’s not a bad thing it just gives me more time to plan and get organised for vintage which should start in three or so weeks going on what I saw in our vineyard today when I looked through the vines and found my first signs of ripening. We have a few bunches of Cabernet Sauvignon that are going through verasion - which is when the berries soften and turn from hard green dudes into soft red tasty dudes. The Wirrega Vineyard where we source some fruit from is always a step ahead of us, it's warmer there (near Bordertown) and so the vines tend to do things earlier. Plus the varieties we source from Wirrega are earlier ripening varieties. I predict that we will kick off with Frontignac (the variety for our Moscato) in the third week of February, stay tuned to see if I am right! This time of year is also about protecting what we have achieved so far. With January feeling like a much cooler month with more rainy days we haven't had to irrigate often but we have had to be vigilant to ensure we don’t get any mildews growing (BOO to mildew!). 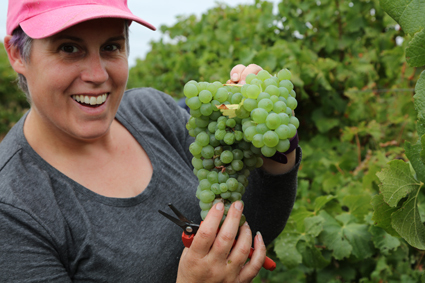 This time of year we like to make sure that there is enough sunlight and wind moving around to keep the bunches dry so we have been out in the vineyard leaf plucking and trimming. We trim most of our vines to keep the canopy in one row from shading the bunches in the next row. Leaf plucking only occurs in our Sauvignon Blanc as it has a big canopy and lots of leaves that can shade bunches hiding in behind. By pulling these leaves off we can get more sunlight in which helps the fruit have better flavour. On the winemaking side of things this time of year it is about putting the ducks in a row to make sure vintage is going to be as smooth and slick as possible. Currently we are doing a final racking of the 2016 reds. This is where we take the wine out of its barrel, then clean the barrel to remove any yeast sediments that stick to the oak and then put it back into barrels making sure they are full, happy and then safely tucked away until the end of crushing. It’s also time to double check the yields in the vineyard and make sure I have enough barrels to hold next year’s red wine and getting my plan in place- it’s like writing the recipe for this year’s crushing. I make sure I have a good idea of how many tonnes we are going to crush, when we are likely to crush them and then a plan of the other winemaking type things. Like what yeast we will use, what temperatures we ferment at, what we want to do when the fermentation is finishing. It’s like setting our goals for how we want vintage to go and then kicking them. So fingers crossed for another terrific vintage at Wangolina. Welcome all ye' faithful to the new Wangolina website & first ever 'blog'. It has been a labour of love, but we've got there. 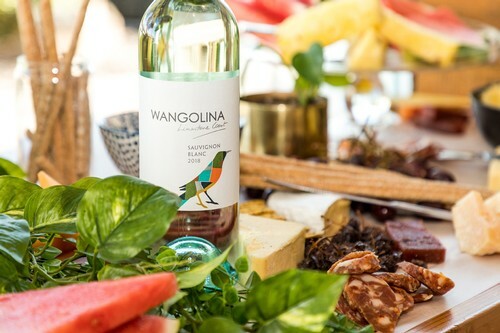 Christmas and the summer holidays is nearly upon us so we wanted to wish all Wangolina friends, families, drinkers, lovers and supporters a very festive season and a marvellous New Year. We of course hope to see you at Saturday @ the Station and throughout the summer months at the Wine Room. In light of recent events within our local community we wish everyone a safe Christmas, keep your families close and enjoy every precious moment. Best wishes from all of us at Wangolina.